It sent shivers down my spine to see the man violently shaking and screaming, being in trance so he didn’t feel the many hooks pierced in his back and chest. The large Indian community in Malaysia celebrates each January the Thaipusam holiday. This Tamil religious festival is held at a temple in the limestone Batu Caves at the outskirts of Kuala Lumpur. 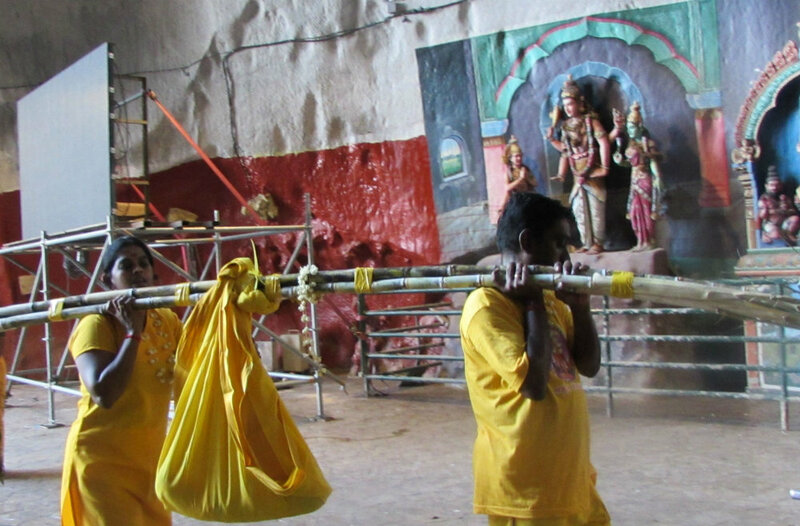 It attracts 1.6 million people who scale up to those caves praising their god Lord Murugan by carrying physical burdens. A few hours Francien and I mingled with the people at this festival to experience this first-hand. Standing on the bank of the river a few hundred meters down from the caves we watched devotees ritually washing themselves in the filthy river, shaving their heads bolt and smearing it with sandalwood paste. 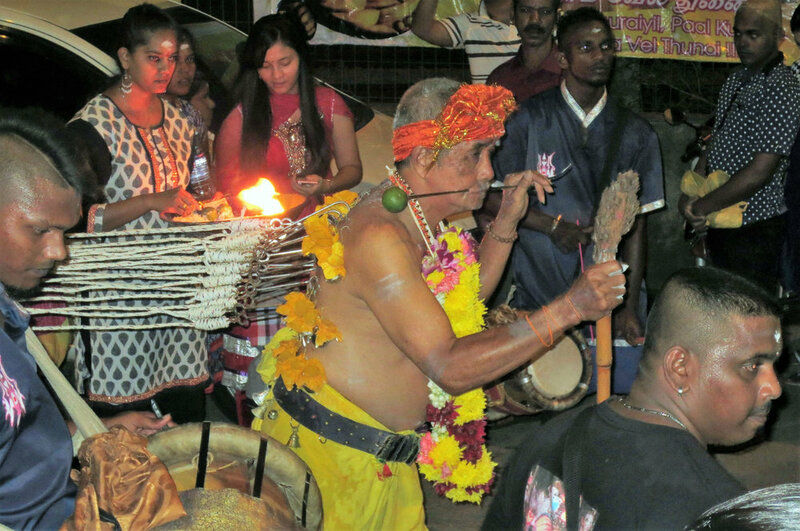 Everywhere was the deafening loud throbbing drumbeats of traditional Tamil urumee’s (a double-headed drum) and the chanting of mantras by the crowds. Men, women and children were colourfully dressed with yellow dominating. Amid the oppressive heat there was a smell of sweat, smoke and incense in the air. Some people were begging for money they donate to the temple, others carried babies wrapped in yellow cloth hanging on bamboo sticks thanking Lord Murugan for their new born’s. Kavadi bearers carried canopies decorated with flowers, gold tassels, holy symbols and peakcock-feathers on their shoulders, some weighing up to 70 Kg! Others carried pots of milk on their heads. They all walked barefoot from the river up the 272 steps into the caves to ritually clean the statue of Lord Murugan with the milk they carried. People were in trance induced by prayers, incense and music, many having their body’s pierced with hooks with flowers and fruits in their backs, chests and chins. Some pierced their tongues and cheeks with skewers and small spears. Friends and family members cheered them on in a cacophony of disorienting sounds. One elderly man passed us, dancing to the rhythm of the drums in ecstasy while pulling two persons holding on to ropes attached to the hooks pierced into his back! We were overwhelmed by the number of sights amid the hectic crowds, rubbing shoulders with devotees. Nearby the river, we stood next to a priest blessing a man in trance who was wildly shaking and shouting. The holy man chanted mantras and sprinkled ash, incense and citrus on the sweaty head of the man. His body was pierced with hooks with lemons, the strain visible on his face. Family members helped him to remain on his feet. A shocking sight!! A young women in a yellow sari standing close-by fainted as soon as the holy man pressed his hand on her head. Woow, not often Francien and I had experienced such an intense and mystifying happening before. On the steps leading to the temple it felt rather claustrophobic to be in such a sea of people. It was hard to comprehend the meaning of so many (at times gruesome) rituals we were privileged to witness. The next day at home we still could hear the deafening sounds of the drums and smell the scents of all those people. Amazing what people do for their religious devotions …. !